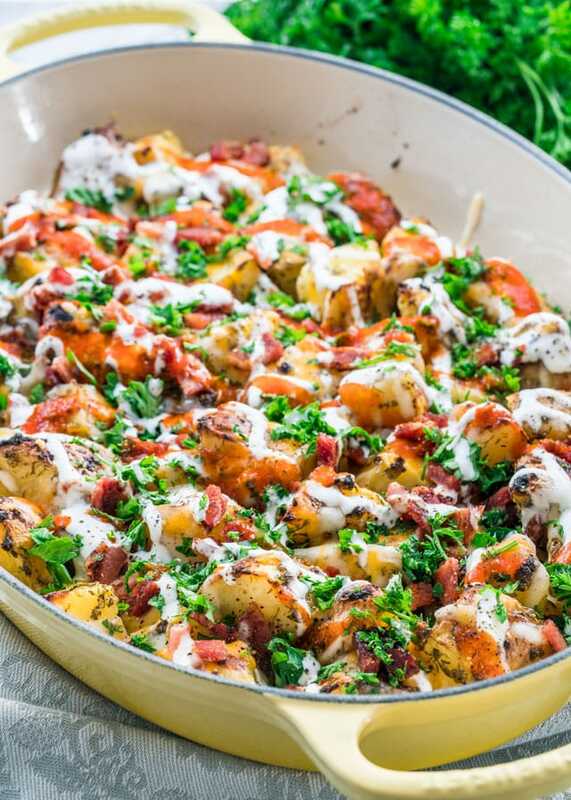 These Cheesy Bacon Ranch Potatoes are incredibly crispy, super cheesy, loaded with bacon and drizzled with sour cream and Sriracha! These potatoes have it all, what’s not to love? Meet my new favorite side dish. 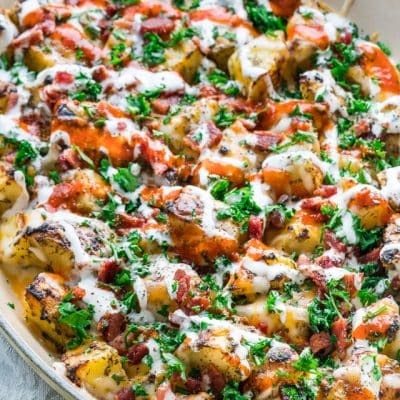 When it comes to roasted potatoes, I used to love my roasted potatoes with garlic sauce, and trust me I still do, but these cheesy ranch potatoes have bacon in them and whenever there’s bacon in a recipe it quickly moves to the top. Sorry mom but these potatoes are the bomb. Being me, a food blogger that is, it’s kind of tough to have favorites because I cook and test recipes all the time, and truth be told, I pretty much love them all. 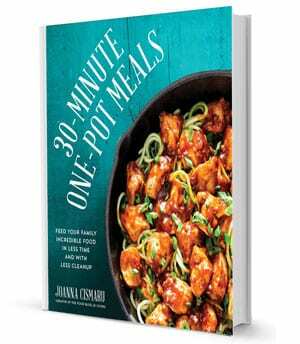 But having favorites is tough, that’s usually reserved for those recipes from my childhood. Unless something like this comes along. These potatoes are soft on the inside, crispy on the outside, flavored with ranch seasoning mix and tons of herbs. I use lots of dill on these potatoes, you may already know that dill is one of my favorite herbs and I find that it goes extremely well with the ranch seasoning mix. And if that wasn’t enough, I then loaded these potatoes with cheese, both mozzarella and cheddar, then comes the bacon and this is where I say, don’t follow the recipe, use as much bacon as you wish. Then because I don’t like boring potatoes, not that they’re boring so far, trust me they’re not, but to make them more exciting I drizzled them with sour cream and Sriracha. I decided to pre-boil these potatoes before actually roasting them because this helps cook them evenly and will also help them crisp up quickly. You want to boil them just until they are fork tender, this will create layer of starch on the exterior surface of the potatoes which will dehydrate as you roast them, thus creating a nice and crispy exterior. That’s the science behind boiling first, but forget science. The important thing to remember here is that these potatoes need to happen in your life. These Cheesy Bacon Ranch Potatoes are incredibly crispy, super cheesy, loaded with bacon and drizzled with sour cream and Sriracha! These potatoes have it all, what's not to love? Wash the potatoes then cut them into cubes. Make sure they're all roughly the same size so that they all cook at the same time. Place the potatoes in a pot and fill it with water, enough to completely cover the potatoes. Salt the water and cook the potatoes until they're fork tender, but not completely cooked through, about 10 minutes. Drain the potatoes. Preheat your oven to 425 F degrees. Spray a baking sheet or casserole dish with cooking spray. You can do this step right in the casserole dish or in a bowl and then add them to the casserole dish. To the potatoes add the olive oil, ranch mix, dill, thyme, oregano, pepper and toss well. Bake uncovered for about 30 to 40 minutes or until the potatoes are golden brown. Remove the baking dish from the oven and top them with the shredded cheeses. Place the baking dish back in the oven and bake for another 5 minutes just until the cheese melts. While the potatoes are baking, fry up the bacon, then chop into smaller bits. 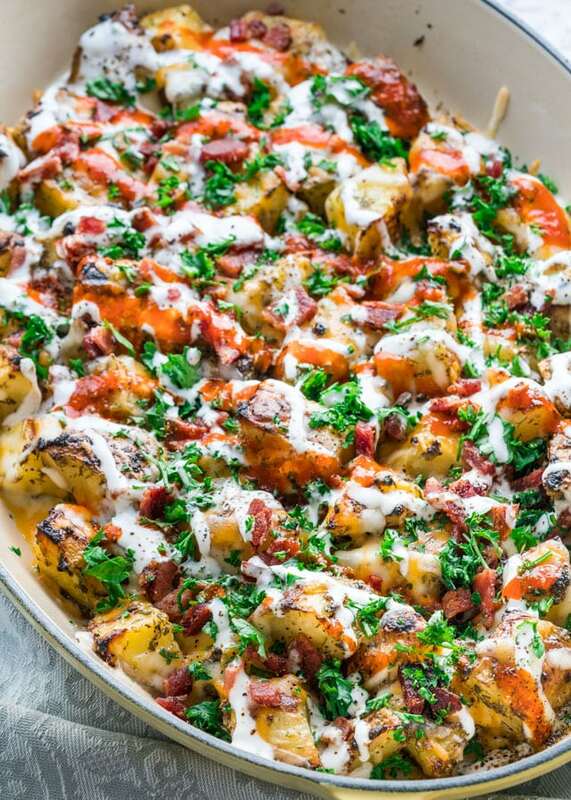 Top the potatoes with the fried bacon bits, garnish with parsley and serve with sour cream and sriracha if preferred. I didn't salt the potatoes because there's enough sodium in the ranch mix but feel free to add more salt if preferred. i do have a question about one item in the ingredient list. 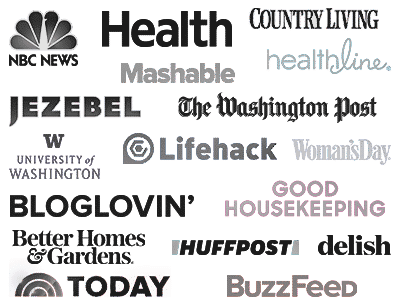 – 2Tbsp ranch salad dressing and seasoning mix. i interpret one way and my husband another. Hi there! That’s actually a brand name, if you click the link you’ll be able to see. Use 2 tbsp of the powdered ranch dressing. No liquid dressing required! These were such a huge hit! I always struggle to find different side dish ideas but this was a great option. Served it with your beer can chicken! Ah, love beer can chicken! What would you recommend having these potatoes with ? I’m definitely going to try these this week ! They look so good ! These are perfect with anything really, especially if you’re having a BBQ! Oh man those taters sure looks delicious! Always on the lookout for new ways to prepare potatoes. I have your other ones like Roasted Potatoes with Garlic Sauce pinned to try too! In Australia we don’t have ranch seasoning mix – can you provide a recipe for it or a substitute? We cannot get it in the UK either is there a substitute or a recipe please? I don’t have a recipe for it yet, but I know there’s dry powdered buttermilk in it, garlic and onion powder, dried onion flakes, salt, pepper, dried chives and parsley. Thank you, will look for something similar and will let you know if I find anything in U.K. This sounds so good. I am on holidays next week and will definetly try this. I think I will also sprinkle with chives or green onion to give it a baked potatoe theme. Your food photos just burst with life, I could take a spoon and have some potatoes through the screen.